Stand out in the show ring and make a statement to the judge! Our premium leather western show saddles feature eye catching silver designs and up to date styles to keep you looking great all season! Take a look at our premium show saddle blankets to complete your look for this years show season! This western barrel racing saddle features a unique and fun design with the words "Cowgirl Up!" 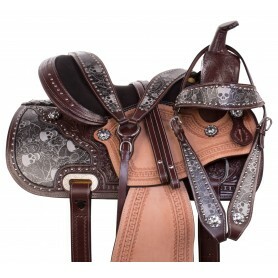 carefully etched in silver on the saddle and on the matching tack set! 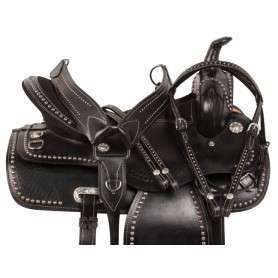 This best selling saddle is now on sale for only $349.99 for a limited time only! 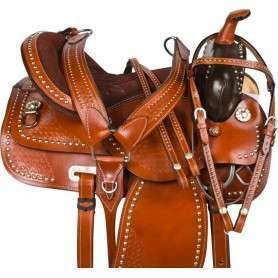 This brown saddle features all over studding that make it a perfect western parade saddle or a fun show saddle! 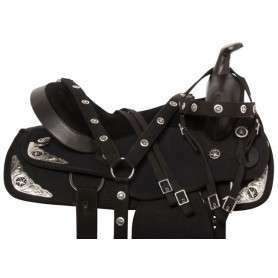 The saddle features flash and comfort for only $299.99 and comes with headstall, reins, and breast collar. This one-of-a kind western skull saddle is sure to turn heads in the show ring or out on the trails! This hand crafted saddle features a printed skull design on the back of the skirt and is also seen on the matching tack set. 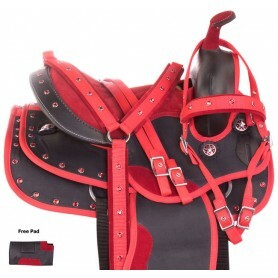 Red is the popular color for this riding season and this saddle doesn’t disappoint with a comfortable red padded seat, decorated in red crystal trimmings and a red nylon binding against black cordura. 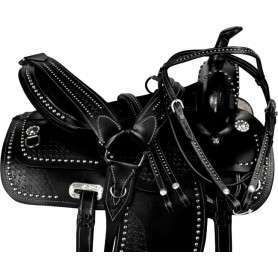 This saddle features cute pink accents including crystal trim around the skirt edges and the cantle, a pink padded seat, and nylon binding around the edges that help make the saddle tear proof.